When you are writing your document there are several layouts which you can work in. You can change between layout using the (View) menu. You can alternatively use the shortcut icons in the bottom left corner of the window. "Normal View" uses far less of your computer resources than "Page View" although it doesn't display the document as it will be printed. In Microsoft Word, switches to normal view, which is the default document view for most word-processing tasks, such as typing, editing, and formatting. (Ctrl + Enter) - Inserts a manual page break. (Alt + Ctrl + N) - Displays the active document in Normal view. (Alt + Ctrl + O) - Displays the active document in Outline view. (Alt + Ctrl + P) - Displays the active document in Page Layout view. (Ctrl + P) - Displays the (File > Print) dialog box. (Ctrl + Shift + F12) - Displays the (File > Print) dialog box. (Print tab, Draft output) - Prints this document with minimal formatting, which may make the document faster to print. (Print tab, Allow A4/Letter paper resizing) - Automatically adjusts the documents formatting to use the default paper size for that country. 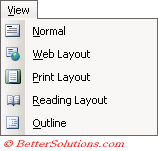 (Print tab, Background printing) - Prints documents in the background, which lets you continue working in Word while you print a document. (Print tab, Drawing objects - Word will include all drawing objects when printing. If not selected a blank box will appear in place of each drawing object. Switches the active document to Web layout view, which is an editing view that displays your document, as it will appear in a Web browser. Switches the active document to page layout view, which is an editing view that displays your document as it will print. Page layout view uses more system memory, so scrolling may be slower, especially if your document contains many pictures or complex formatting. "Outline view" displays the logical structure letting you drag headings and reorganise quickly. Switches to outline view, in which you can examine and work with the structure of your file in classic outline form. Work in outline view when you need to organize and develop the content of your file. To adjust the starting page number (Insert > Page Numbers)(Format button) You can either set the starting number or continue from the previous section. You can also change the number format and / or include chapter numbers. You can double click the little rectangle just above the top vertical scroll bar and this will split your screen horizontally (Window > Split), double clicking the boundary bar will remove the split (Window > Remove Split). If you always work with the View percentage on 100% (or even 110%) you can probably see both edges of the page (in page-layout view). In this case you may want to remove the horizontal scroll bar to display another line of text (Tools > Options)(View tab, "Horizontal scrollbar"). You won't need to see the Rulers most of the time, so remove them (View)(uncheck Rulers). When you do need a ruler hover your cursor just below the grey area at the top and the ruler will slide out. Do you gain an extra line ?? To get detailed measurements on your ruler click on a tab or margin marker on the ruler and press both mouse buttons. The normal ruler is replaced with a distance ruler. To preserve the layout of your document some markup elements (insertions, deletions, formatting changes, comments) appear in the text of the document. It displays others in balloons that appear in the margin. The Outline level refers to the Heading level - ie the level at which the paragraph will appear in Outline view. This is the property that you see in the Format > Paragraph dialog box under Outline Level. All Built-in heading styles have an outline level. If you create your own heading styles they too will have outline levels. A heading style is any style that has an Outline Level between 1 and 9. If a style is not a heading style then is has an Outline Level of Body Text. These are notes of reference, explanation or comment. A word in the main text can be marked with a footnote or endnote reference mark. If you want to change the location of your footnotes / endnotes, number format, starting number, or numbering system (continuous, resart each section, restart each page) click on Options. If you inadvertently format a manual page break as hidden text and then specify that hidden text is not printed, Microsoft Word ignores the manual page break. The new page won't display when viewed in Print Preview (File menu), and the new page won't print. To remove the hidden text format, first make sure you can see the manual page break: switch to normal view, and, if necessary, turn on hidden text by clicking Show/Hide on the Standard toolbar. Then, select the page break, click Font on the Format menu, and clear the Hidden check box.